Construction Innovation is pleased to announce the release of a new publication authored by Clare Diaper, Grace Tjandraatmadja and Steven Kenway. 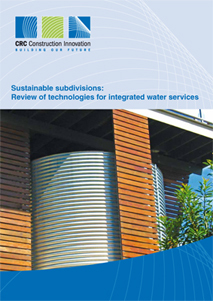 Sustainable Subdivisions: Review of technologies for integrated water services investigates improved planning and management of water in Australia to ensure reliability of water services and to support ongoing growth of our cities. Sustainable Subdivisions: Review of technologies for integrated water services deals with emerging water supply, wastewater treatment and reuse technologies at household, cluster and subdivisional scales.